This entry was posted in Something about Mary on March 5, 2011 by admin. 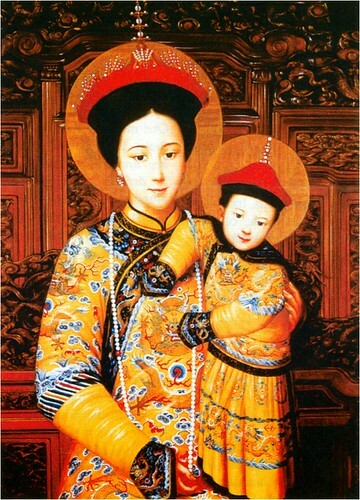 Our Lady of Beijing, pray for us! This entry was posted in Something about Mary on July 19, 2010 by admin. Here’s a post i wrote on In Layman’s Terms about our Spiritual Mother. This entry was posted in Something about Mary, Uncategorized Blazes on May 9, 2010 by admin. Most Blessed and Sorrowful Mother pray for us! “O thou Mother! fount of love! This entry was posted in Something about Mary on March 14, 2010 by admin. This entry was posted in Something about Mary on February 11, 2010 by admin. This entry was posted in Something about Mary on December 26, 2009 by admin. Murilllo’s religious paintings are some of the best in all Christendom. I like this portrait for the month of Our Lady of Holy Rosary. This entry was posted in Something about Mary on October 22, 2009 by admin. Queen of Martyrs pray for us! This entry was posted in Something about Mary on September 15, 2009 by admin. Hail Holy Queen… a prayer of hope. August 22, the Queenship of Mary. The prayer of the Hail Holy Queen is one of the most beautiful prayers ever composed. It was composed by Blessed Herman Contractus of the 11th century. Considering the author, it is that much more powerful. He had a cleft palate and cerebral palsy. Blessed Herman suffered. He was raised by monks and eventually became one himself, being wheeled out on a cart. I can feel what he must have felt whenever I pray that prayer and other Marian prayers that he composed. Blessed Herman poured out so much in the Salve Regina. It is a prayer of hope*, a loving pleading. The Queen is so close to us. She makes our life sweet. She brings us LIFE. Our sufferings become more bearable when we know that our Mother is mercifully looking down upon us, her children. She is a symbol of hope and at the same time our hope itself. She intercedes for us with her Son on our behalf. God Most Merciful and Compassionate, has bestowed upon us the great gift of the immaculate Virgin Mary, Mother of God. When Jesus ascended into heaven he took his place at the right hand of the father. he is with us and within us, most especially in the holy Eucharist. The Lord Jesus also took his mother up into heaven, body and soul, so that she can also be with us as our mother. He, the King of the Universe, crowned her as the Queen of the Same. Our Lady reminds us that God will raise us all from the dead at the last day and will give us all a crown of victory. Hail Holy Queen, Mother of mercy, our life, our sweetness, and our hope! To you do we cry, poor banished children of Eve! To you do we send up our sighs, mourning and weeping in this vale of tears. Turn then, most gracious advocate, your eyes of mercy toward us; and, after this our exile, show us the blessed fruit of your womb, Jesus! This entry was posted in Cloud of Witnesses, Something about Mary on August 22, 2009 by admin.